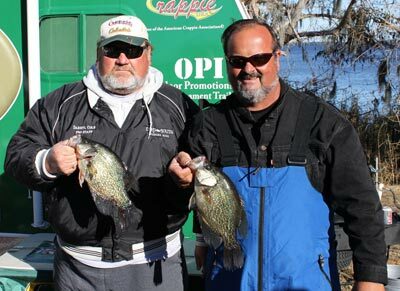 This past Saturday January 22, 2011, Crappie USA held a qualifying event at the City Ramp in Margary Neal Nelson Sunrise Park on Crescent Lake at Crescent City, Florida. 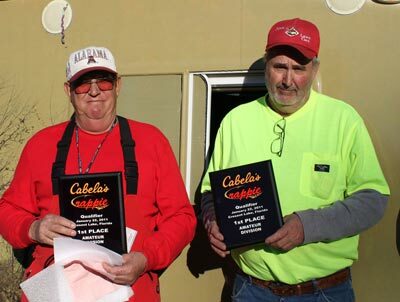 These anglers were competing for not only cash and prizes, but a chance to advance to the prestigious Cabela's Crappie USA Classic. This year's classic will be held October 12-15, 2011 on the Kentucky/Barkley Lakes at Paris, Tennessee. All the teams caught large numbers of fish during practice only to have the fish to shut down on tournament day. Most of the teams did not catch over the 7 fish needed to weigh in a limit on Saturday the day of competition. Taking first place was the team of George Parker of West Palm Beach, Florida and Daryl Cole of Leesburg, Florida with a weight of 10.74 pounds and earning $1,100.00. George and Daryl were long line trolling the north end of Crescent Lake using stardust colored AWD and Slider jigs in 8-10 feet of water. The team kept the boat slowed down to 1 MPH in the wind using double jig rigs with the fish hitting much slower today than they had been hitting during the week in practice. 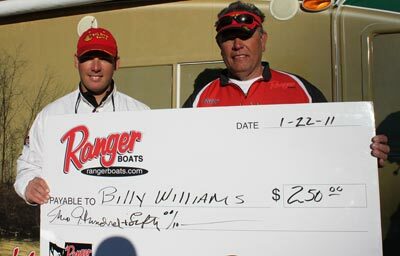 Second place went to the Cochran, Georgia team of Billy and Scott Williams with a weight of 10.45 pounds and earning $650.00. Billy and Scott also captured big fish of the event with a 2.42 pound crappie earning the team an additional $250.00 plus an additional $250.00 for the Ranger Cup Award. The team was fishing the north end using brown Big Bite Jigs catching their bigger fish early in the morning. In all the team earned a total of $1,150.00 in the event. In third place was the Gray, Georgia team of Steve Deason and CB Sightler with a total weight of 8.26 pounds and earning $450.00. Steve and CB only caught 8 fish during the day of competition after capturing over 100 fish per day all week during practice. Like many others the team fished the north end of the lake using brown and orange AWD 1/8th and 1/16th ounce double jig rigs in 10-12 feet of water. First place in the amateur division was the team of Harold Ingram of Macon, Georgia and Thomas Pfost of Kathleen, Georgia with a weight of 8.42 pounds and earning $600.00. Harold and Thomas were long line trolling Tom's Crappie Jigs in 5-12 feet of water in the Dead Lake Area using a double jig rig with 1/16th ounce heads. Second place went to the Camilla, Georgia team of Beth and Danny Williamson with a weight of 7.92 pounds and earning $400.00. Beth and Danny were trolling brown/orange AWD baits on the north end of the lake, double rigging 1/16th and 1/48th ounce jigs. "The fish were much slower today than the last 5 days", said Beth and Danny. To help combat the slow bite the team dropped down to 4 pound test Vicious Line. Taking third place was Gary Luke of Seville, Florida and Brad Hull of Pine Island, Florida with 7.79 pounds and earning $200.00. Gary and Brad were fishing the Dead Lake area anchored casting live minnows under floats in 6-8 feet of water. Second big fish of the event was captured by the team of James Whitt and Gary Bishop of Trinity, North Carolina weighing in at 2.19 pound and earning $100.00. Congratulations to all the teams fishing this event. For a complete list of tournament standings and downloadable photos for this event visit www.crappieusa.com. In conjunction with the tournament Crappie USA held their Kids Rodeo on Saturday morning with several local children attending the event. All the participants signed up for a chance to win one of 6-$2,000.00 scholarships to be drawn for at the Cabela's Crappie USA Classic. Crappie USA and our anglers have contributed nearly $302,000.00 to the "Crappie Kids" Scholarships since 1997. We are very proud to be a part of the education process for the youngsters who participate in our tournaments as adult/youth teams and those who fish in the Crappie USA "Kids Fishing Rodeos".